The multiple echo thickness gauge Multigauge 5600 is a simple, but very resistant multiple echo thickness gauge, designed for many applications. Some examples of the application of the multiple echos thickness gauge are the inspection of boats, pipelines and bridges. 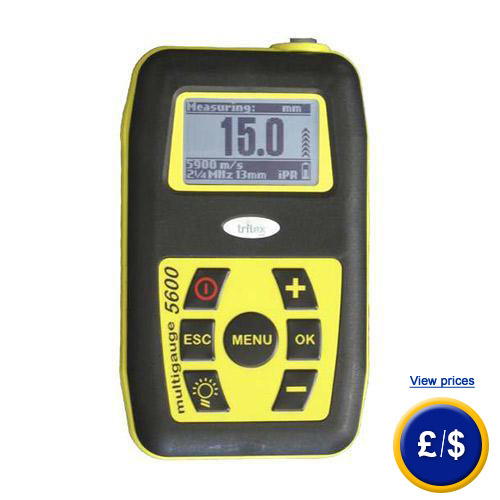 Because of the very bright display of the multiple echo thickness gauge, it can be used in all lighting conditions. Moreover, the multiple echo thickness gauge bribes with a unique design. The rubber parts are very soft, so the ultrasonic wall thickness gauge lies very comfortable in the hand and is maximum protected against bumps and scratches. All sensors from the multiple echo thickness gauge support IPR (Intelligent Probe Recognition) whereby the machine's performance is greatly improved. Moreover guarantees the AMVs (Automatic Measurement Verification System), that only relevant results are displayed, even on the rustiest materials. Furthermore the ultrasonic wall thickness gauge makes use of the multiple echo technology, this technology ignores layers such as paints. 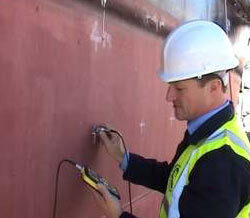 This allows the measurement of the material thickness without the need to remove these layers before. 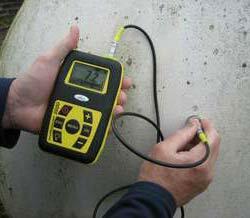 Thus it is an ultrasonic wall thickness gauge for non-destructive thickness measurement. In addition to these technologies, the device can be easily calibrated via the menu and can be used for 20 hours continuously and has a warranty of 3 years. Alternatively we can offer you nearly the same underwater ultrasonic thickness gauge Multigauge 3000, which can even be used below the water surface. 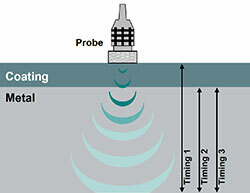 Here you will find an overview of all ultrasonic wall thickness gauge (s).. If you have further questions about the ultrasonic wall thickness gauge Multigauge 5500, look at the following technical information, read the technical data or get in contact with us: UK customers +44(0) 23 809 870 30 / US customers +1-410-387-7703. Our technicians and engineers will inform you about our ultrasonic thickness gauge (s) or any other product in the field of regulation and control, measuring instruments or scales and balances of PCE Instruments Ltd.